For some, China’s harsh new food safety law, which will officially take effect October 1, couldn’t be implemented too soon. Politicians hope that it will signal a new direction for the food industry in China by holding manufacturers accountable for food additives and introducing harsh fines for safety violations. For investors in food business, the law will mean more stringent requirements for product regulation and certification, especially for organic and health food products. Whether or not the food safety law will be able to put an end to China’s food scandals remains to be seen, but regardless, the increased demand for foreign food imports brought on by domestic food scandals is expected to grow. Foreign food imports have annually increased 15 percent in recent years, and the amount of food imports has more than quadrupled in the last ten years. By 2018, China is expected to become the top importer of foreign food products, with the total value of food imports set to reach RMB 480 billion (US$77 billion). Edible vegetable oils, cereal and milk products account for roughly half of all food imports. Of particular interest among food imports are organic food items. Once seen as a luxury food item, imported organic foods are an increasingly accessible option for a Chinese consumer base with a growing disposable income. 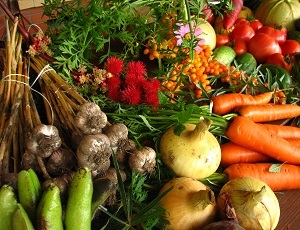 The organic food market in China has tripled since 2007 to currently account for 1.01 percent of total food consumption, which is still lower than the 5 to 8 percent of the market in areas like Europe and the U.S. Current rough estimates for the market value of organic imports are around US$20 million, with consumers typically middle and upper class Chinese with children. In a consumer study carried out on 204 Chinese organic consumers in Beijing and Shanghai, 71 percent were ready to pay a premium of 20 to 50 percent for organic products. The top five reasons for buying organic were all related to food quality assurance. To meet growing demand for food imports, a number of high-end specialty stores have opened up across major cities. Ole Supermarkets, a new high-end supermarket chain with imported goods accounting for over 70 percent of its products, is expected to reach 50 stores by next year. Supermarket chains like Wal-Mart and Carrefour have also been banking in on demand for imported products and goods and have even taken extra measures to assure quality of products distributed. Carrefour invested RMB 5 million (approximately US $800,000) to establish its own food safety lab to test products before distribution, and Walmart’s green and organic products come directly from its own farm cooperatives in China, through the Direct Farm Program it established in 2007. In addition, Chinese consumers have been increasingly turning to online retail and O2O (online to offline) platforms for their food and beverage consumption demands. There have even been a number of online retailers specializing in organic products, like FieldsChina.com and KateandKimi.com, that have opened up to meet growing demand for natural and organic products. Fields China has delivered to over 200 cities in China so far, showing that demand for health foods reaches far beyond the scope of China’s top tier cities along the east coast. Online distribution platforms are seen to be particularly promising for organic and specialty foods, as they can help cut product costs and can provide more product guarantees – two of the biggest hurdles that organic products face in becoming more widely consumed. Despite the new food safety law’s harsh penalties for safety violations, the government may find it difficult to reduce concerns about food safety that sometimes go beyond harmful food additives and manufacturing malpractice. In June 2014, a national five-year soil survey revealed that up to 40 percent of rivers and 20 percent of land in China is polluted. Pollutants from the land inevitably make their way into agricultural produce and then onto consumers ’plates, like the excessive levels of cadmium that were found to be present in at least 10 percent of all domestic rice. Consumers are all too aware of these harrowing facts, driving their preference for foreign food imports and organic products that are perceived to better meet quality requirements. As the largest consumer market for food and beverages and the fastest growing food market in Asia, the food and beverage market in China offers many opportunities to foreign investors. Investors in food business should fully familiarize themselves with the new food safety law as well as the different licensing protocols for food production, catering, and distribution in China. In this special edition of China Briefing, we provide an overview of the retail industry in China and the procedures for setting up a retail shop, focusing specifically on brick-and-mortar physical retail stores. Further, we have invited our partner Direct HR to offer some insights on the talent landscape in the retail industry, as well as tips for recruiting retail personnel in China.